Deeper Understanding, a collection of 6 short films (Mother knows best, The Future Perfect, Sauna the dead, The guy from work, The orchid, No strings). Without doubt I enjoyed the full length film Beautiful Something :-). It was a bit dull to start with, with a broke guy going to a quiet gay bar, picking up a guy, going back to his place for activities, nothing special. But one once gets past the first 20 mintues or so and one gets to know the characters, it becomes a great film :-). At the film festival, the director was there to answer some questions after the screening that we saw, and it turns out that a lot of it is based on his own experiences. The first collection of short films was pretty good too :-). Although I didn't care at all for the first film which was called The love archive, the next one called Dinner with Jeffrey was mildly amusing. In Dinner with Jeffrey a young gay guy has dinner with his gay uncle, ends up in bed with a young male friend of the uncle, with an amusing catch at the end! More interesting was Discretion, where a university professor (aged about 40, married to another man) ends up indulging in activities with one of his young male students. He feels terribly guilty about it afterwards, but should he confess to his husband? However the collection of six short films that we saw were, on average, much lower quality. They're probably more the sort of thing that one expects to see at a film festival, namely films of relatively little merit that would never see the light of day if it wasn't for film festivals! This was the last thing that I saw with Close Encounters, and afterwards we end up discussing some of them. "I didn't see the point of some of some of those films," I say, trying to convey my overall view that on average these six short films weren't very good. "I didn't think they were that bad!" replies Close Encounters, sounding genuinely upbeat about what he'd just seen. "How would you rate them," he continues, "using a scale of 1 to 10 like imdb.com does?" "Oh come on," interrupts Close Encounters, "it was better than that :-). I thought that it raised some interesting issues. The parents of the young gay guy were presumably divorced. Gay men are often closer to their mothers than their fathers, so why did the gay guy in the film get on so much better with his father?" "Well perhaps it was an interesting situation," I answer, "but we didn't really get to see any of it because the whole film is just a single conversation with the mother." "And honestly," I continue, "The guy from work, that gets 1/10 and I'm being generous!" "No way, it wasn't that bad!" protests Close Encounters, "I'd probably give it a 3 or a 4". "So what's the lowest rating that you'd ever give?" I ask, wondering whether film ratings are a bit like ratings that get given for fine wines. Wine review web sites like eRobertParker.com give scores out of 100, and it's absurd to me that the scale seems to start around 50/100 instead of 0/100 or 1/100! "Sometimes I do actually log into imdb.com and give ratings," he answers, "and I think I've given just 3/10 on a few occasions." "But haven't you've been to a lot of film festivals over the years? Haven't you seen 100's if not 1000's of films? On a scale of 1 to 10, an average film should be rated 5, and the worst films that you've seen should get just 1. Otherwise you're not using a scale of 1 to 10 :-)." "I'd probably give The orchid an 8/10," continues Close Encounters, ignoring my complaints about his rating scale. "But it was only 3 minutes long!" "Yes exactly," he replies, "and it was memorable, even though it was such a short film!" "What about Sauna the dead," I ask, "Obviously a joke name because it sounds like Shaun of the Dead. Perhaps that gets 3 or 4/10 from me. I hate horror films :-(. It's the kind of film that must have been great fun making, but not so much fun to watch!" "I'm not a fan of horror either, but short horror like that is fine :-)," responds Close Encounters. "But how can you have a film that's set in a gay sauna, and not even show a single raunchy buttock of any of the cute actors!" We continue discussing the films for another ten or fifteen minutes, but with other things to do, eventually we have to go our separate ways. If any other readers saw any of the films in the gay film festival this year, please leave a comment and let me know what you thought. 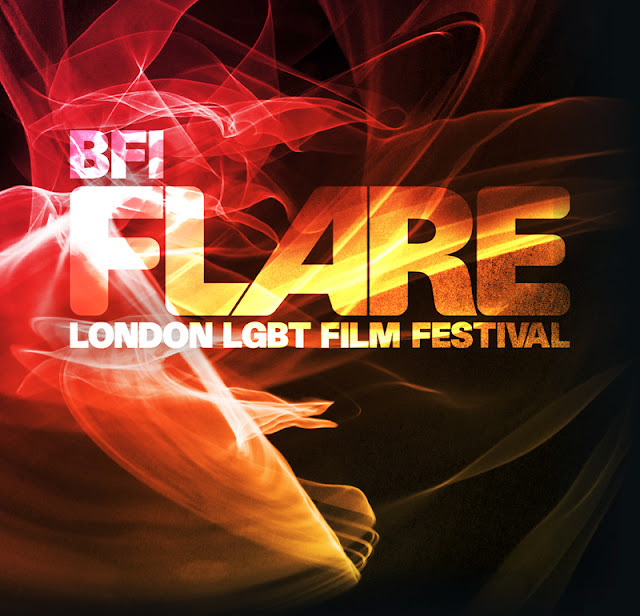 And if you didn't see any of the films, perhaps you should put a note in your diary to visit London during the gay film festival next year :-). Although some of the films seem worthless to me, every year that I've been I've always seen at least one great film!